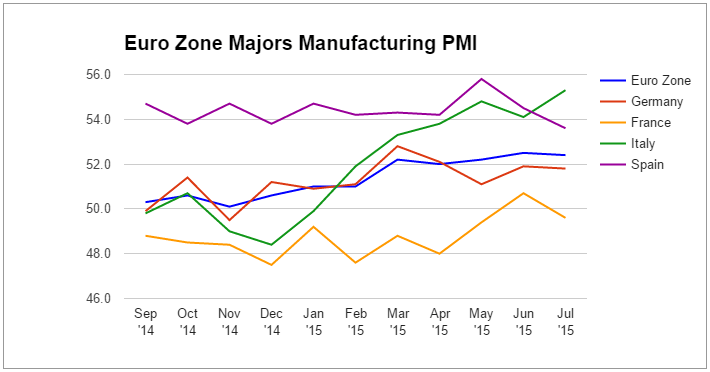 Global Manufacturing PMI Update: Steady As She Goes! What’s up, forex friends? Do y’all need another major update? Of course you do! 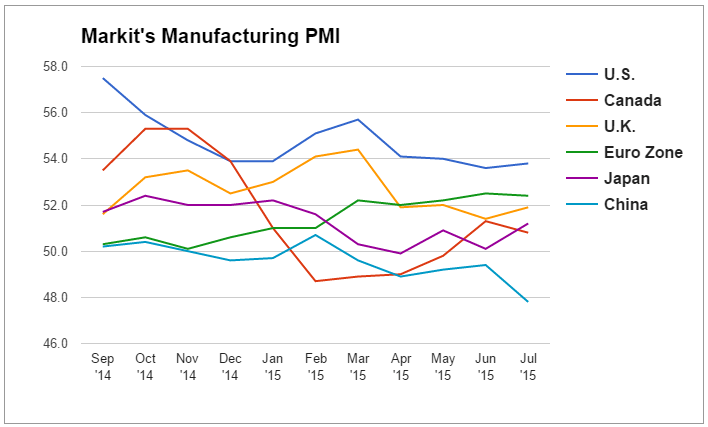 This time, I have a manufacturing PMI roundup for most of the major economies. For the newbie forex traders out there who are just tuning in, the Purchasing Managers’ Index or PMI is a survey conducted among the purchasing managers of various companies in the manufacturing sector. It is very important because it acts as a leading indicator for the manufacturing sector and because many central banks make use of PMI readings when considering their respective monetary policies. The main problem with PMI is that there are many survey providers and their methodologies sometimes vary to such a degree that comparing the PMI levels of various economies is like comparing apples and oranges. Fortunately, Markit collects the PMI data of most of the major economies, with the exception of Switzerland, Australia, and New Zealand, which is why we’re relying primarily on Markit’s PMI readings. Okay,enough of that! Let’s get this show on the road! As advertised, the current trend among most of the major economies seems to be one of stability – still above the 50.0 neutral level and no major deviations in the last three months. The only ones buckling this trend are China and Canada since the former saw further declines while the latter was climbing steadily, although it finally saw a slight drop in July. As for China, Markit’s Chinese report shows that China is in deep trouble since employment levels declined for the 21st consecutive month and production levels contracted for the third consecutive month. Apparently, the weakness in China’s manufacturing sector was due to a one-two punch of declining domestic and overseas demand for Chinese goods. Interestingly enough, Markit’s reading and the official PMI data issued by the National Bureau of Statistic of China (NBS) are beginning to diverge greatly since the official reading is stubbornly refusing to go below the 50.0 neutral mark, which is rather strange given China’s economic slowdown and all the other troubles that China has been experiencing lately. Speaking of diverging PMI readings, Markit’s report for Uncle Sam and the report released by the Institute of Supply Management (ISM) are at odds too since Markit is saying that the expansion accelerated in July (53.8 latest v.s. 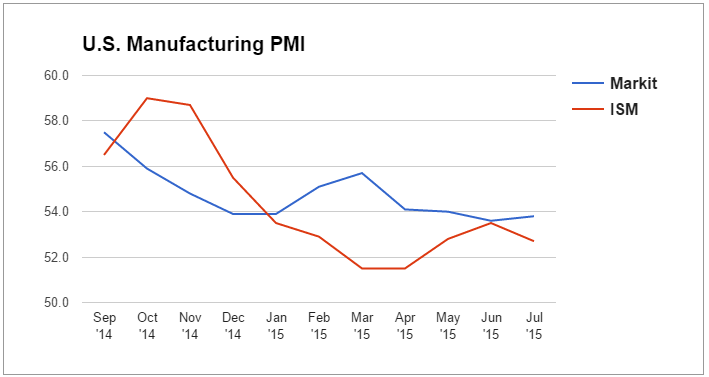 53.6 previous) while the ISM is saying the opposite (52.7 latest v.s. 53.5 previous). Moving along, the manufacturing sector in the U.K. remains subdued, but it finally climbed higher to 51.9 in July after dipping to a 26-month low in June. According to Markit’s U.K. report, the main driver for the increase was continued strength in domestic demand, which managed to offset the weakness from poor overseas demand brought about by the “sterling-euro exchange rate hitting competitiveness in eurozone markets,” which is a fancy way of saying that the pound is just too darn strong. Incidentally, the Bank of England also complained about the strong pound in the latest MPC meeting minutes and inflation report, which is probably one of the reasons why forex traders dumped the pound. Did you catch that move, by the way? Getting back on topic, Japan’s manufacturing sector expanded for the second month (51.2 latest v.s. 50.1 previous) due to production increasing at the quickest rate since February of this year and employment rising at the fastest rate since December 2014. In addition, Markit’s Japanese report states that overseas demand saw a pickup due to “new product launches and success in gaining new international clients.” I guess you can add this to my monthly economic review as another positive sign of a recovery in Japan. Last but not least is the euro zone. According to Markit euro zone report, the manufacturing sector in the euro zone was little changed (52.4 latest v.s. 52.5 previous) despite all that drama with Greece, thanks to continued domestic and overseas demand. Breaking down the euro zone’s PMI reading, Italy was the top dog (55.3) among the major euro zone economies, followed by Spain (53.6) and Germany (51.8). France, meanwhile, was actually a drag since it posted a 49.6. And if you’re wondering, Greece was last in line at a ridiculously low 30.2. Overall, most of the world’s major economies seem to be seeing some stability and continued yet subdued expansion, including the euro zone, which had to deal with all that drama from Greece. 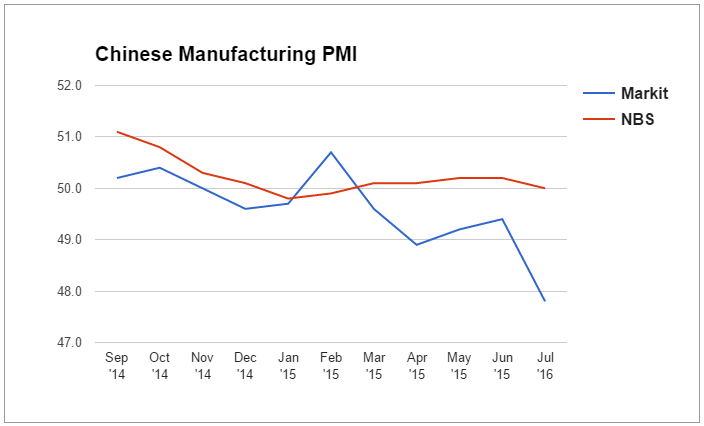 China is a bit worrying, though, since Markit’s PMI reading is indicating deteriorating conditions. And given the interconnectedness of the world’s economies and China’s status as an economic superpower, that is almost certainly a bad thing, especially if the trend continues.